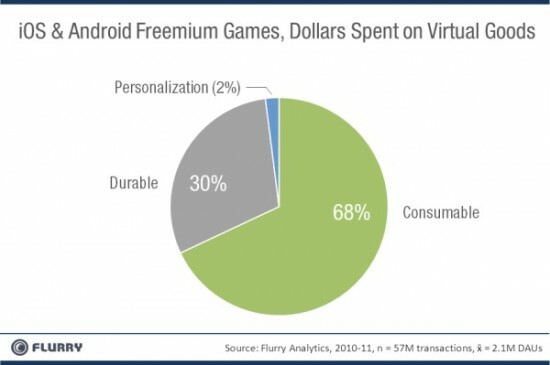 So here's an interesting piece of data concerning the buying habits of Android users concerning in-app purchases. A lot of so-called free apps and games make their money by offering users to pay for different stuff after they've downloaded the app. As surprising and outlandish as it sounds, the average in-app purchase comes to about $14 a pop. Now that's a hefty some for a group of consumers that has traditionally been classified as cheap and poor. And the worst part is: most Android users are waisting their money on virtual goods that have absolutely no value (like extra bushels of virtual wheat and special virtual powers). Out of the millions of in-app purchases, a vast majority of them are going towards so-called consumable or perishable virtual goods. Most people are giving out their credit cards to get that coveted submachine gun to beat the final level, increase their virtual health or just amass a ton of digital cash. Have we become so sucked into our virtual reality on our smartphones that we are willing to real money for virtual success? This is obviously great news for developers who are relishing the fact that users are so desperate to beat a game that they are ready to pay for it. So for future developers the best way to make a ton of money is to create some sort of virtual currency and force users to buy it in order to advance to the next level. Other kinds of in-app purchases such as monthly subscriptions for content or different kinds of personalized items (such as ringtones, wallpapers and homescreen replacements) are not nearly as popular with consumers. As counterintuitive as this may seem, smartphone users will think twice about paying a one-time fee for an app, but have no second thoughts about shelling out money for random valueless stuff in order to satisfy their short-term goals. @Harshad Well, I think that's what app prices are for. I am all for paying for a high quality app/game or buying the full version after trying out the free version. If say the free version includes only 10 levels and you like the game so much that you would like to continue then you can easily pay for the full version. There are just games out there that are literally IMPOSSIBLE to beat without buying certain and I think that's unsportsmanlike conduct. @Zhu I didn't mean to say that the pay off is for the effort to create virtual currency/commodity, but for the effort to create the app/game itself. @Martin I think it totally makes sense to pay for air-sync functionality because you're actually getting something. I mean you are paying for a service that a developer made. @Harshad I tend to differentiate between in-app purchases that give you extra features to in-app purchases for winning a game or getting virtual points. it didn't take the developer much effort to create a virtual currency that other people buy into. I think it's dishonest. We shouldn't assume that users are dumb by default. Perhaps they are well aware that it is just a virtual commodity, yet they are purchasing it to support the developer's efforts. Thi is only about Games isn't it? I ask because the only in-app purchaise I did was in doubletwist. And that is not a Game. And I did not get any comodity but the air-sync functionality. it's true, but it gets kind of scary when people become truly addicted and lose their sense of reality. @ Jean: Yeah, I agree. I could live with that. I'm OK with people paying for stuff to, for example, personalize their character in a game. In other words, it's ok to pay stuff that in no way affects your progress or success in a game. i can't believe people actually fall for this crap. who cares if you have a ton of virtual dollars???? i think it really depends on the game. sometimes paying a little money to get ahead isn't exactly wrong, but it gives you a slight advantage which is nice. interesting post! I think this raises a whole set of moral questions about the way in which games have been evolving lately. I think it is dishonest and frankly ruins the whole gaming experiences when games are structured in such a way that you absolutely have to pay money for stuff in order to win. Are there any agencies tracking this phenomenon? The whole point of a game is that you can beat it on your own. Paying for a game is fine, but asking people to pay money for extra powers/points is just immoral. I think the world has gone totally crazy when people are paying real money for virtual money. It's just absurd.